Amazing. Painful. Epic. Difficult. Emotional. Uncomfortable. Memorable. Aching. Inspiring. Excruciating. Worth it. I had 5 hours and 35 minutes yesterday to experience a range of emotions and thoughts. My attempts to convey them all circle back to one all encompassing phrase: Wow, that was incredible! 31 miles of running was about as hard as I was expecting. It’s also just about as ridiculous as it sounds. 5 and a half hours of running. I did it for partly for myself. I wanted to prove to myself that I could do it, mentally and physically. But I did it mostly for my mom, and all the other moms, sisters, grandmothers, aunts, and wives, who are fighting breast cancer. The 31 miles were for my 31 years of being alive. I was able to raise nearly $3,700 for breast cancer research. And was fortunate enough to not have to take a single stride by myself all day. Yes, it was incredible. Every aspect of it was damn near perfect. But what’s most impressive was the support and encouragement I received from our community. Friends and family coming from all over to run alongside me or making a generous donation. It was my birthday, sure. But it wasn’t all about me. It was more so about a collective group of people supporting each other for a cause greater than themselves. That’s what I’m most grateful for today. Thank you again to everyone who ran, donated, celebrated, or so much as shared some words of encouragement. Now for the run recap! I started at 6:00 am along side two friends, Todd and Elina. My wife, Karen, was on her bike providing support and serving as photographer for the day. Todd recently got back into running and has been steadily increasing his mileage in recent weeks. 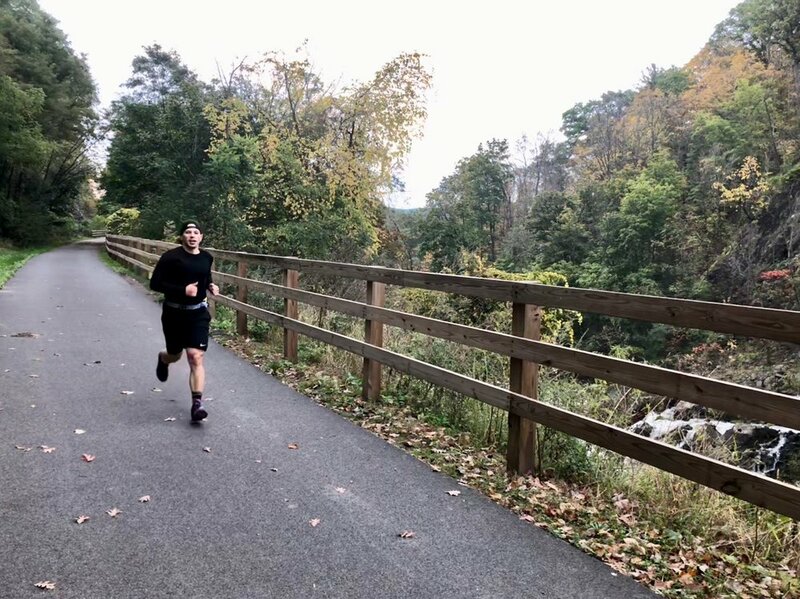 He ran 10 solid miles, his longest run in a few years. Elina is training for the New York City Marathon in a few weeks and scheduled her final long training run for this event. 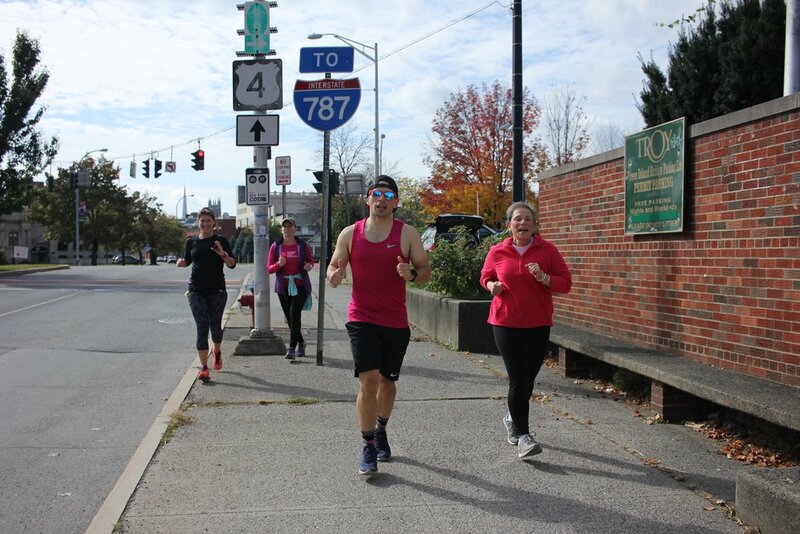 After 22 fantastic miles her husband and two kids greeted her with hugs amongst the abandoned buildings in Albany’s South End. Picturesque for sure! 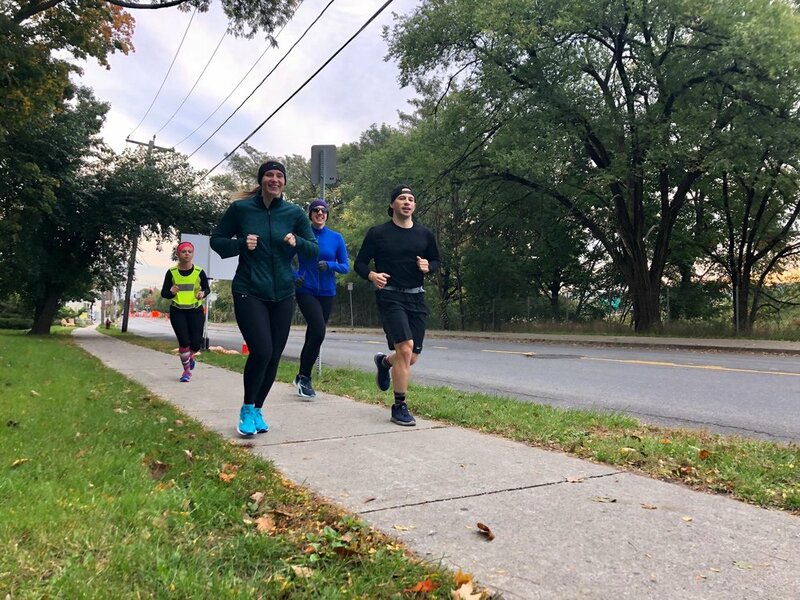 Once Todd wrapped up at Mile 10, Elina and I carried on until the two SENS Fitness triathletes, Melissa and Jess, joined in for 6 miles of their own. I joked to Elina that she had the privilege of running with the entire SENS Fitness Triathlon team. Melissa and Jess and are still trying to convince her to sign up for a race! I was still feeling quite good at this point and even had my fastest mile splits from miles 9 through 15. I knew the wall was coming at some point, I just wasn’t sure when if I’d hit it head on or at least feel it coming. At the turn around point some 15 miles in, Karen swapped out with my brother-in-law, Dan who provided support for the remainder of the run. Karen’s coworker Emily hopped in with us for 3 miles near the turnaround as well. On the way back, things were going fairly well. My good friend from high school, Stu, made the trip up from Pennsylvania and ran the final 12 miles with me while pushing his son in a stroller. I’m not sure I could push Gia in a stroller for 12 miles while running. A few bathroom breaks off the side of the trail and I was feeling good. The end was inching closer, my pace was steady, my legs were strong, then the dreaded wall! It wasn’t abrupt, luckily. I could feel it coming on and it finally hit at Mile 24. I was expecting it sooner so I was pleased I held it off as long as I did. Those last 7 miles were a bear to say the least. Despite the pain and my left leg being nothing more than dead weight swinging around, I managed to keep my pace from completely falling off. It helped that I had a large group of reinforcements join me around that time to run. Our largest pack of runners was 8, including myself. That was awesome! My nutrition strategy was working as well as I had planned. Every 30 minutes was a gel or stroopwaffle plus electrolytes as I needed. The goal was to get about 300 calories and 150mg of sodium per hour. I damn near nailed it. My stomach felt solid throughout the day and handled it well. Once I got to three miles out, I started to feel a bit better. This long run almost being over surely helped. At Mile 30, my mom joined the brigade and we mostly walked the final mile together. I couldn’t tell you what we talked about, or really what I talked about all day with everyone else. It’s a blur now. The post run beers probably have something to do with that. But, crossing that finish line, a pink ribbon, with my mother is something I’ll never forget. In short, it was an epic day that I was grateful to share with my family and close friends. Thank you to everyone who made it possible. I’ll let the legs recover for a few days then it’s back on for training for Ironman Mont Tremblant!